I had a great time posting stuff to facebook and twitter during the Golden Globe red carpet and awards! Check out both platforms for Tinsel & Tine's thoughts on the show! The People’s Choice Awards aired on Wednesday, kicking off the start to the 2013 awards season for the entertainment industry. However, I believe that the Critics' Choice Awards truly kick off the season, foreshadowing the winners for the coveted Oscar. Best Picture: Argo vs. Lincoln. I thought Lincoln had it in the bag. With fine actors such as Daniel Day Lewis, Sally Field, David Straithairn, and John Hawkes and Steven Spielberg at the helm, Lincoln looked like a sure bet. But then Argo swooped and scooped that award up and my thoughts about Best Picture for the Oscars went out the window. (side note: same thing happened at the Golden Globes) I am quite pleased for Ben Affleck, he's come a long way, after all, it's been an eon since he won an Oscar for Best Screenplay. Best Actor in A Leading Role: This is the one category that bears no contest. I’m sorry Bradley, Hugh, Denzel and Joaquin. Daniel Day Lewis is getting ALL the awards in this category! I never knew the man to have such a great sense of humor. This was the first time, in the real world, where he seemed vulnerable and cracked jokes and seemed so at ease, practically telling the director to end the show in the toilet. That’s the way to go. Why have it any other way? This man is a true artist and an inspiration for fellow actors everywhere. Best Actress in A Leading Role: This is the category that turned me out. It will continue to turn me out for the rest of this year’s awards season. Ms. Chastain winning the Critic's Choice really threw me for a loop. (side note: and once again at The Golden Globes). Although I haven’t even seen Zero Dark Thirty yet, I know Jessica can act. THE WOMAN CAN ACT. But I thought Jennifer Lawrence was scooping this one. I’m a J Law fan but even though she is a beast of an actress herself, I suppose she's an underdog when compared to Chastain. Bottom line, I absolutely adore both women and I hold their acting techniques in the highest regard. Best Actor in a Supporting Role: I couldn’t call this one. My hope was for Christoph Waltz (side note: who did win The Golden Globe) to grab this award, because I think he is just sublime in Django Unchained. But, then I thought that De Niro would take it. 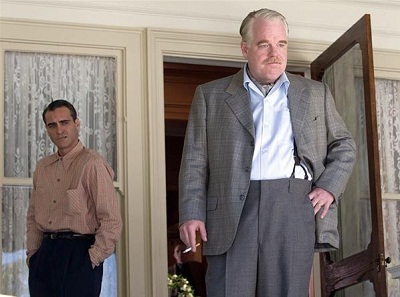 And in the end, I truly believe Philip Seymour Hoffman deserved it. An actor’s actor, the critics love this man, as do cinema lovers everywhere. Best Actress in a Supporting Role: Like Daniel Day, Anne Hathaway is taking all the awards in this category this year. It’s a wrap! No contest! The only thing that made me cringe, as I’m sure it did for many others watching, was her essay on how her first name was misspelled on screen. At first it seemed cute and just so “Anne Hathaway”. Then I wanted her to stop. When she said “gauche”, I died a little on the inside. Best Young Actor/Actress: For a slight moment, I thought that either Anna Hayward or Logan Lerman would win (this was complete wishful thinking because you guys know that Perks of Being A Wallflower was my jam last year and a win would have just made everything complete for me), but there just hasn’t been enough heat on either of them like there has been for Ms. Wallis. And really, how anyone could have done what she did in Beasts of the Southern Wild - she worked. So win she did, and I couldn’t take my eyes off her. I don’t care what the media is saying- about her being too young, and how she could end up like the scores of other disgraced former child actors, She’s confident. She’s ready. The buzz for this film and Quvenzhane Wallis performance has been going strong since I was at the Sundance Film Festival premiere last year, and it just keeps going. It’s Jennifer Lawrence in Winter’s Bone all over again. If the stars continue to align and the right people continue to guide her along the way, she will go far. Best Acting Ensemble: Well-deserved Silver Linings Playbook! Every time I see just two people from this cast come together at junkets or on the red carpet, I sense a bond and mutual respect that does not occur on every film set. I’d like to think that having the City of Brotherly Love linked with this film is one of the defining factors for this (shameless plug of hometown city). Best Director: This is a category that, for me, is fraught with blankness in my head. Sometimes, I truly don’t know what to think about it all. Why wasn't Ava DuVernay considered for her spectacular Middle of Nowhere (for that matter, I wish that Emayatzy Corinealdi was considered for Best Actress as well). I was surprised that Ben won this round too. Critics seemed to dive head over heels for Kathyrn Bigelow’s Zero Dark Thirty. At least I knew for a fact that Ang Li and Tom Hooper were out (the critics love (most of) the performances of Les Mis, but the direction of the film has been cut up to pieces, proving that critics can be, indeed, critical to the point of being cruel), although I was taken aback at how much shade Ang Li caught during this whole affair. No love? None at all for the man? Then, Affleck went right on ahead and snubbed the Oscars, as they dutifully snubbed him for a Best Director nomination. Was that necessary Ben? Best Original and Best Adapted Screenplay Winners were no surprise. 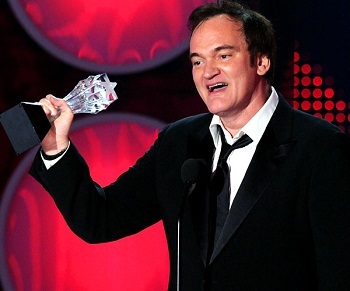 Quentin Tarantino has haters, but the man can write. (side note: as attested to by his Best Screenplay Golden Globe win) Should the film industry die in a pit of fire one of these days, Quentin will emerge writing novels and short stories. I didn’t see anyone else beating Tony Kushner for Best Adapted Screenplay. Not even Stephen Chbosky. Sad face. There were several points in the night where I was reminded that I was watching this whole night play out on The CW (presenters from The Vampire Diaries; visions of Kristin Kreuk from Smallville/Beauty and the Beast). But this realization really hit home for me during several categories such as: Best Action Movie: Skyfall. Slam dunk. As much as I LOVED The Avengers and The Dark Knight Rises, and my love for Joseph Gordon Levitt knows no bounds, I couldn’t see anyone taking this award away from the Bond legacy. Best Actor in an Action Movie: Daniel Craig. No contest. Not even from Batman. Best Actress in an Action Movie: Anne was out in my mind. Not enough heat for Gina Carano, especially because Haywire feels like it came out years ago. I didn’t consider Emily or Judi to take this one. J Law became the obvious winner, especially because The Hunger Games is critically lauded, both in book and movie form, and Jennifer Lawrence is like Parker Lewis at this point- she can’t lose. When the night turned its leaf over to comedy, this is when I felt like I was watching a posh version of the MTV Movie Awards with a touch of the Nickelodeon Awards. I started to get very excited. Best Comedy: This fact that 21 Jump Street made it on this list shut me up completely. I thought this movie was truly going to be horrendous. Was I ever pleased that it exceeded my expectations to a level where I found myself wanting to write Channing Tatum’s agent, telling him/her that the man needs to forever act in all comedic films from this point forward. I was also surprised at Bernie being in this category, only because it seemed like the wildest of wild cards. But no surprise that Silver Linings Playbook cleaned up the win. Then Rebel Wilson and Judd Apatow took over and I was done. I tend to think that Apatow is the only comedy producer in Hollywood. He isn’t, but it feels like it. Then you thought things ended with Kristen Wiig and Melissa McCarthy? 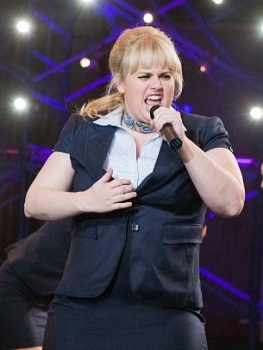 Rebel Wilson has elevated the comedy game to a whole other level in the past two years, right under people’s noses. She surfaced in Bridesmaids, but really did her thing in Pitch Perfect, making people wonder where this spitfire came from - well, from down under - Australia, that’s where. Best Sci-Fi/Horror Movie: Only three titles for this category? Sinister couldn’t even make it on this list? 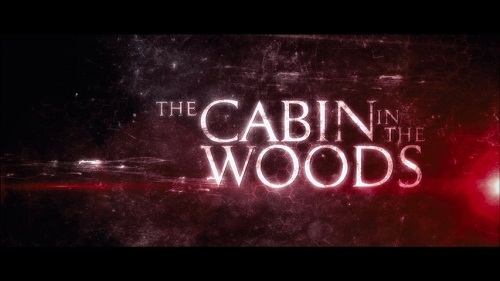 Out of the three to choose from (Looper, Prometheus, and Cabin in the Woods), I thought Cabin in the Woods had a chance. But once again, even though critics had a ball with another of Joss Whedon’s masterpieces, Looper had more heat behind it, and Cabin in the Woods, like Haywire, was a distant memory. Best Foreign Language Film: Didn’t see Amour, but knew it would win. Even though critics also love Rust and Bone, Amour seems to be the favorite. Life of Pi won for Best Visual Effects. 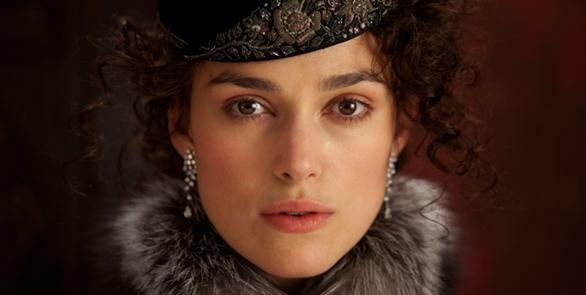 Best Costume Design and Best Art Direction went to Anna Karenina, both well-deserved honors. All-in-all, the night was enjoyable to watch. I started to think about the last time I watched the Critics’ Choice Awards - I don’t think I ever have! Now that both "good time" award shows have passed, it's time for the serious business of the Academy Awards (Feb 24). Each year we wonder if these preceding awards determine the Oscars. The only prediction I find it safe to say, Adele will most likely get her first Oscar and I’m very glad of that. Candace Smith is a native Philadelphian and graduate of Syracuse University (BA) and City University of London (MA). After spending a few years living in London, Candace returned to Philadelphia and continues to forge a career as a freelance journalist, writer, blogger, actress, and host. Besides interviewing intriguing personalities for Urban/Suburban Magazine, she is also currently contributing her knowledge and skills to various artistic movements, publications, websites, and podcasts such as REP Radio, AFFRM, and Hipolitics. It's hard for her to pin down her favorite movie and food of choice, but she is a HUGE fan of a great Indian curry and the film "Repulsion" by Roman Polanski is in her top ten must-sees.